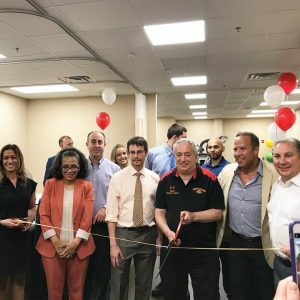 Pain Relief Clinic Opens in North Bergen, NJ - Synergy Spinecare & Rehabilitation Medicine, P.C. Dr. Seth Schran is Board-Certified in Physical Medicine and Rehabilitation, with a subspecialty in Sports Medicine. Pain Management is becoming the go treatment to method for patients suffering chronic pain in the United States. Individuals suffer pain level changes daily. The pain in your back. Your tired. Your concentration is off. Those pounding headaches. These are just a few symptoms of chronic pain that affects some nearly 40 million adults (17.6 percent) in the U.S. Conditions like Fibromyalgia characterized by widespread musculoskeletal pain, can be tricky to diagnose and treat. Pain from accident or injury requires a proper diagnosis to be properly treated. Ganglion Impar (Coccyx) Blocks and Trigger Point Injections/Soft Tissue Injections. Dr. Schran and staff specializing in pain management are excited in the opening of their new branch in the North Bergen region of New Jersey. Dr. Schran and staff have had excellent success in treating pain full conditions (back pain, neck pain, whiplash, shoulder pain) from auto accidents, sports injuries, work related injuries. Patients suffering from chronic pain can schedule an appointment to determine the best treatment for their existing condition once diagnosed. These non-surgical treatments encourage healing in the afflicted areas. These treatment are for patients who experience acute and chronic pain from an injury. “The non -invasive treatments offered at the new North Bergen location are no different then our Teaneck, New Jersey location.” Dr. Schran said. “The specific treatments are designed to help relieve many different types chronic pain, including arthritis and neuropathy as well as lower back, hip pain, knee and neck pain.” Dr. Schran said. Our friendly staff at Synergy Spinecare. The friendly staff at Synergy Spinecare in North Bergen is here to support you as you recovery so that you may return the quality of life and activities you enjoy. Dr. Schran and staff are excited to take on more patients and bring them healing at the North Bergen, New Jersey location. 1. 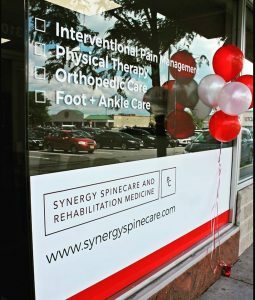 Synergy Spinecare New Jersey Pain Specialists have opened at 3107 John Fitzgerald Kennedy Blvd, in North Bergen, NJ..
2. The clinic accepts most all types of insurance including workers compensation insurance and no fault insurance. 3. The clinic specialties will include pain management, orthopedics, and physical therapy services.